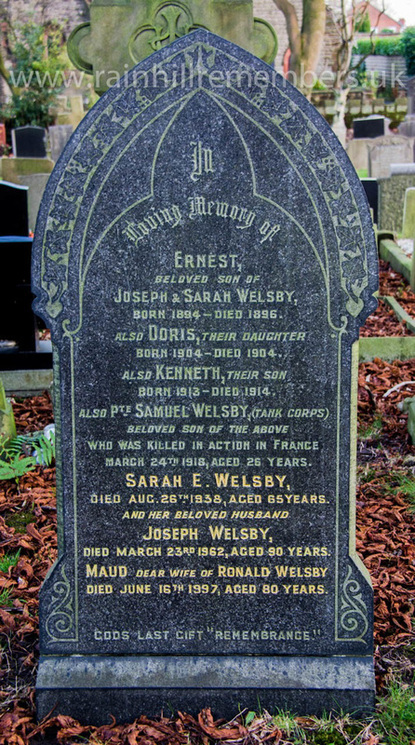 Samuel Welsby was the eldest child of Joseph and Sarah Elizabeth Welsby, living at 5, Market Street, Rainhill. He was born in Rainhill in 1893 and his father was a confectioner. In 1911, Samuel was listed as assisting in the family flour confectionary business. He had three sisters, Lily, Elizabeth and Dorothy and two brothers, Alfred and Harold. He enlisted in Liverpool as Private 38244 in the Machine Gun Corps, later becoming Private 200192 in the 1st Battalion Tank Corps. This was the heavy branch of the Machine Gun Corps, formed on 27th July 1917. Samuel’s Battalion was involved in the Battle of Cambrai. It commenced in November 1917 and Samuel was one of 8 members of a crew in a Mark IV tank. All tank crews had wanted for some while, ground that had not been churned up. 474 tanks assembled south-west of Cambrai with the aim to break through the Hindenberg Line which was composed of thick barbed wire and wide trenches. There was very heavy fighting and losses on either side and a new offensive was begun on 18th March 1918. A strengthened German army, due to the Russian collapse on the eastern front, inflicted many losses of men and tanks and Samuel was one of those killed. Several documents record that Samuel was killed in action on 25th March 1918 aged 25, but this cannot be verified as several men were noted as 'missing' on the 24th March. The family grave records Samuel as killed in action on 24th March 1918. He is remembered at Pozieres Memorial, Panel 94. The name of Samuel Welsby is inscribed on the family grave stone in St. Ann's Churchyard, Rainhill.